To Understand on which phones Jio Sim card is supported ? or do I get free data offer on my phone here is the 3 different categories of phone list which will clear your doubt. JIO SIM only works on 4G enabled mobiles i.e. your phone should have 4G network service in it. Now if you want to check does my phone have 4G or not then please go through below link - How to Check My Phone Has 4G Enabled or not ? List of All 4G Enable Phones on Flipkart and Amazon. 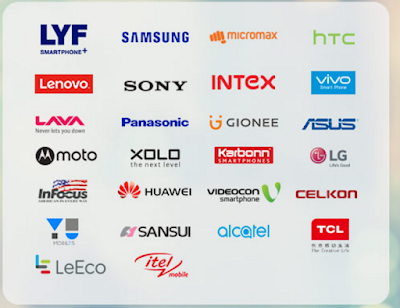 voice facility, these are specific list of phones where you will get complete free everything till december, 2016. This category belong to phone which have 4G Enabled in their phone and Support VOLTE i.e., Voice Calling Over LTE network so that you can make voice call over 4g network that is why it being called unlimited free voice calling facility. Please Note Only caller need to be on JIO Network, from where you can call any mobile, landline number. you can List below in the list on same page. See B Section in below list. These are the phone which support 4G ( LTE ). This belongs to all the phones which has 4G can use the JIO SIM card, get discounted data offer but voice calling is not free since their phone do not support VOLTE. A. The phone’s listed below support 4G LTE data on Reliance’s Jio network. B. The phones listed below support VoLTE apart from the regular 4G LTE. whether HTC DESIRE 510 CDMA/4G LTE PHONE IS COMPATIBLE WITH JIO 4G. does meizu m1 note support VoLTE? Lenovo Zuk Z1 has Qualcomm Snapdragon 801 chipset. Does it not support VoLTE over Reliance Jio? Does it support Swipe Elite Plus for jio 4g sim? if it supports 4G connection then yes or else no. Will it support on galaxy note 3 sm n9005 lte ? Will Karbonn Quettro L50 HD support Jio Sim, VoLTE and 3 months free preview (data and Voice)? Will it support HTC desire 820 dual sim ? 26 September 2016 at 04:53 delete This comment has been removed by the author. Does lenovo vibe K5 note support VOlTE? 28 October 2016 at 21:04 delete This comment has been removed by the author. How to convert LTE phone to VoLTE phone?? Does Miezu MX4 Pro support JIO SIM? Meizu MX4 Pro can support VOLTE? Hi there, Does LG g4 supports VoLTE? If yes, does it work exactly like other VoLTE phones, I mean can internet calls be made without turning on the internet? Will it support a3 2017? will it support REDMI 4 PRO / PRIME? Does it support on Moto Droid Razr M xt907??? Do 'Lenovo vibe K5 note' support VoLTE? And do 'Lenovo vibe K5 plus' support VoLTE? Will it support Samsung S4 mini? will the Huawei Honor5X support to the VoLTE.